Food and water provide the necessary nutrients for your preschooler to remain healthy and active. Just like a car needs the right gasoline to perform effectively, a child needs the correct “fuel” to be able to tackle the business of living! Parents, then, must monitor more than just vitamin content and calories when feeding a preschooler. They must be vigilant about food and drinking water safety. A common problem is improper food storage. To put it simply, keeping food at the correct temperature will help prevent a child from becoming ill. This becomes even more important once warm weather arrives. Family barbecues can be tremendous fun; however, foods that have been left out too long, such as potato and macaroni salads made with mayonnaise, can go bad rather quickly. So, to promote safety, keep cold foods cold with blocks of ice and/or ice packs. In addition, if any grilled hamburgers, hot dogs, or chicken legs remain, cool them quickly in the refrigerator. If wrapped properly and kept cold, they should remain safe to eat for several days. Another food issue during warm weather months is the temptation to purchase items at local events, including swap meets and flea markets. While most food served by vendors has been prepared properly, some of it has not been handled using the proper guidelines. To keep your preschooler from contracting a food-borne illness, make sure that the vendor you buy treats from has obtained the proper licenses required for operation. Keep in mind that health departments hire professionals to train and monitor all legitimate restaurant/vendor operations. Basically, if you choose to purchase food at a local fair or other event, make sure the proper authorities have given their stamp of approval! Another way to ensure your preschooler does not become ill is to make it a habit to keep abreast of food recalls and safety alerts. The Food and Drug Administration (FDA) maintains a great web site with up to the minute news on recalls, market withdrawals, and safety alerts. Click here to access the site. 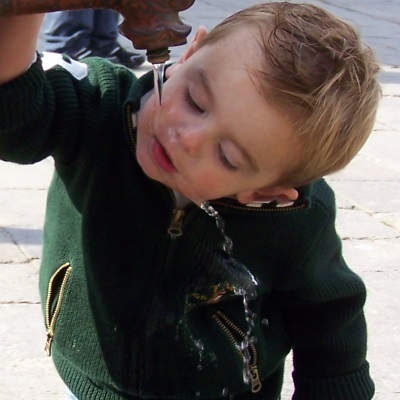 As mentioned earlier, drinking water can also be a safety concern for preschoolers. During the spring thaw, wells can become contaminated. For instance, in the northern part of the United States, bacteria and nitrates can infiltrate a home’s water supply due to the runoff from melting snow. Because of this, it’s best to have well water tested at a local health department once per year. If found to be undrinkable, experts will assist a homeowner with ways to correct the problem. Well water can also become infected at other times of the year due to insect infestation and flooding. A good rule of thumb — if the drinking water supply begins to smell or changes color, have it tested. And, while waiting for the results, purchase drinking water from the grocery store. As you can see, food and water safety is important. Keep your preschooler from becoming sick by learning all you can about proper food handling and storage, and about well water safety.